1. Take 1600 mg of a good triglyceride form omega 3 fish oil like Fortifeye Super Omega. This form of omega 3 fish oil will help to improve the Meibomian gland functioning and secrete a healthier outer lipid layer of the tear film. Take 1600 mg a day if you weigh less than 200 lbs and take 3-4 per day if you are heavier. 2. Heat the Meibomian glands with a warm wash cloth or a Bruder mask for 10- 15 minutes two times a day. Heat applied to the Meibomian glands will help to unblock these glands an allow a healthier secretion of tear film. The Bruder Mask is very convenient and last ten years at a cost of only $25. 3. Use a good unpreserved artificial tear 2-8 times a day. 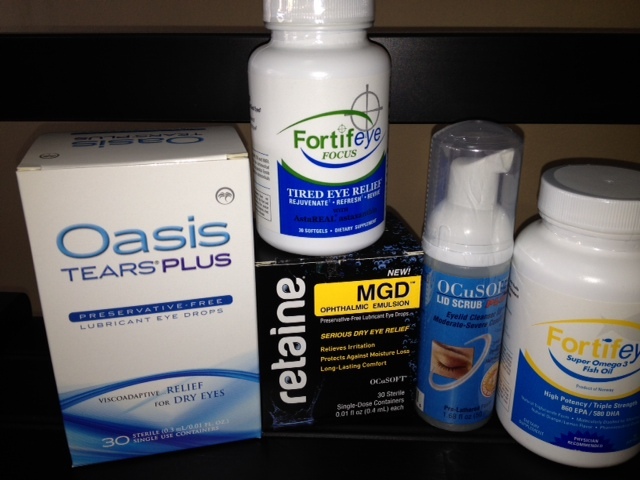 Three great brands are Oasis Tears Plus, Retaine, and Blink Preservative free. 4. Good lid hygiene is crucial. The lids harbor all types of bacteria, mites ( Demodex), viral and allergic flora. Cleansing the lids with an anti microbial cleanser like occusoft or Cliradex. Occusoft is great to clean the lids of most forms of viral, allergic and bacterial flora. However many people have Demodex on their lashes that will not be eradicated with occusoft and must use Cliradex instead. If eye lids are crusty, red swollen and itch then Cliradex may be best first choice to use for lid hygiene. Cliradex will cause a tingling sensation on the lids but is very effective at treating most forms of lid microbes. 5. The addition of 6 mg of Astaxanthin (Fortifeye Focus) once daily helps to reduce tired dry eye symptoms. Fortifeye Focus contains lutein, zeaxanthin and astaxanthin. The combination of these three nutrients is great for the retina, skin and dry , tired eyes. 6.. Make sure you drink half your weight in ounces of spring water or well water. Do not drink purified water from distillation or reverse osmosis. Drink 1-2 glasses of coconut water a day for even better hydration. 7. patients that have tried to top 6 steps and are still having some dry eye symptoms after 3-4 months, they may want to add GLA 140-160 mg and a good multi vitamin like Fortifeye Once Daily. People with any dry eye condition should always go to their local Optometrist or ophthalmologist to be evaluated and have a proper diagnosis and treatment plan. The 7 steps above are for educational purposes and never replaces an eye exam.